Cook the asparagus in a large pan of boiling water for 2 minutes. Add the broad beans and simmer for a further 3 minutes until both beans and asparagus are tender. Drain, separate the beans and asparagus, and set aside. If you have time, use your fingers to pop the broad beans out of their shells, otherwise, serve as they are. To poach the eggs, bring a large pan of boiling water to the boil. Crack the first egg into a teacup then gently slip the egg into the water. Do the same with the remaining egg then simmer very gently for 1 minute. Turn off the heat, cover and leave to sit for 5 minutes until the eggs are just set. 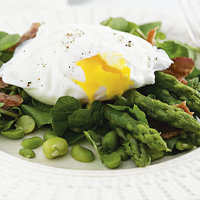 Meanwhile, toss the watercress and cooled beans lightly in 2 tablespoons of the dressing and divide between 2 bowls. Top with the asparagus. Lift the eggs from the water using a slotted spoon, drain well, and then place one on top of each salad. Break the bacon into pieces and scatter over the top. Drizzle the remaining tablespoon of dressing over and serve straight away with warmed crusty bread. When poaching eggs always use the freshest you have in the fridge older eggs are more likely to break as you lift them out of the pan. Try adding different seasonal vegetables, such as radishes, tomatoes or mixed salad leaves. Pair substantial salads with a piquant New World rosé.